The Hammer Museum played host to the third annual “Her Dream Deferred: On the Status of Black Women,” a three-night series held by the African-American Policy Forum (AAPF) that is intended to offer analysis and dialogue surrounding the current status of black women and girls in the United States; and to explore multifaceted solutions to social injustice. 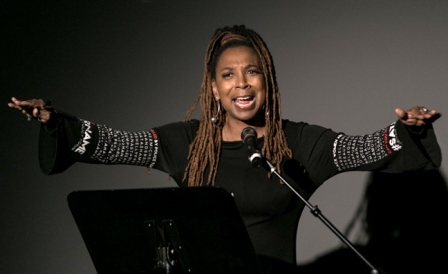 The annual “Her Dream Deferred” series is anchored by fellow UCLA Professor Kimberlé Crenshaw, a co-founder of the AAPF. In the 1980s, Crenshaw coined the term “intersectionality” to describe the point of overlap between racism and sexism and how it plays out particularly for black females in America. It is this intersectionality that lends itself to the creation of the hashtag #SayHerName, which seeks to bring awareness to the countless number of women and girls who have been killed by law enforcement. As a result of the Black Lives Matter movement, it has become common to hear the names of many black victims of police brutality and criminal injustice, such as Michael Brown, Eric Garner and Tamir Rice. 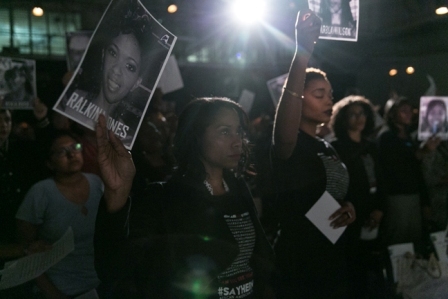 With far less frequency does the public hear from any source about the multitude of black female victims who have been subject to police brutality or the failure to prosecute individuals who have slain black girls and women. 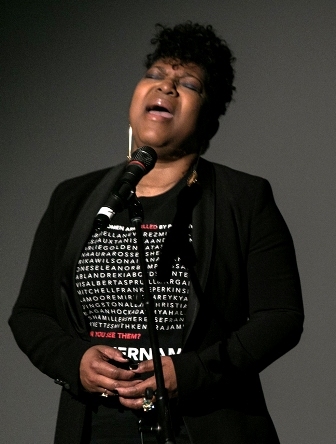 “The #SayHerName movement is trying to uplift some of our most marginalized voices, black women and girls,” said Abby Dobson, curator of the evening and AAPF Artist in Residence. One of the women cited during the panel discussion was Sandra Bland. Her story was one of the few about the plight of an African-American woman that made national news. On July 10, 2015, Bland was pulled over for a routine traffic stop for failing to use a turn signal when making a lane change. Dash cam video and a video recording of a bystander revealed that as a state trooper forcefully propelled her towards his car, he slammed her to the pavement. Three days later she was found hanging in a jail cell. The outcry of support came from the public demanding answers and an investigation into her death. There were protests across the country that questioned the reason for her arrest, that challenged the coroner’s finding that she died as a result of a suicide and that alleged misconduct on the part of Texas police. The panel discussed other black females that included Tanisha Anderson, Korryn Gaines, Michelle Cusseaux, India Beaty, Kayla Moore, Meagan Hockaday who were alleged victims of police misconduct and/or abuse that failed to garner much media attention. Crenshaw kicked off the evening by instructing the packed room to stand. As she read off the names of these women, she asked that each attendee be seated when they heard a name of a black woman whose story they were not familiar. As she read off the names one at a time the room shifted to the front, where the last people standing were the family members of the late women. “It’s really important that family members are involved because it reminds you that this person is so much more than a statistic,” Dobson said. Michelle Cusseaux, for instance, was a middle aged black woman who was fatally shot just days after Michael Brown. She was shot at close range by a Phoenix police officer who was called to take her to a mental health facility. The responding officer, Sgt. Percy Dupra, claimed Cusseaux threatened him with a hammer. This is but one of the moments during the three day forum that the room was filled with the sounds of sniffles and streams of tears. Cusseaux’s mother emphasized how uncommon it is for police to be adequately trained to respond to issues of mental health. Cusseaux’s death shed light on police killings and its intersectionality with victims who have mental health conditions/illnesses. “It’s curating for affect and effect. And it’s curating to cultivate empathy that will push people to move beyond their current position,” commented Dobson. Kimberlé Crenshaw was joined on a panel by Dr. Stevenson and Loyola Law Professor Priscilla Ocen moderated by best-selling author and journalist Laura Flanders. 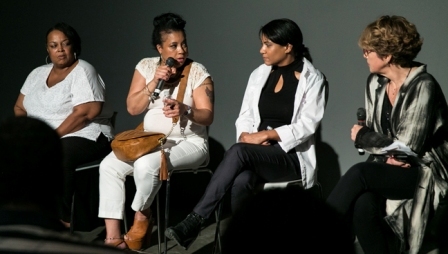 The purpose of the panel was to analyze the details of the highly publicized story of Latasha Harlins, a 15-year-old black girl shot in the head by a female Korean grocer in Los Angeles in 1991, which was just 13 days after the infamous Rodney King beating. The Korean grocer alleged that Harlins was shot for attempting to steal a bottle of orange juice. A video recording of the incident showed that Harlins had placed the orange juice on the counter with money in the other hand. After a brief physical altercation, Harlins began to walk out of the store with nothing visible in her hands and nothing found on her to support that she had stolen any item when she was shot in the back of the head. “The message to young black girls is that your life is devalued,” said Ocen, who was just a few years younger than Harlins at the time. Black girls and women continue to be the targets of widespread violence with minimal accountability systems in place. According to the Vera Institute of Justice and Safety and Justice Challenge, the fastest growing jail population is women of color. Black women, in particular, are disproportionately incarcerated and make up 44% of women in jail. The series closed out with a panel of six women led by Dr. Crenshaw for a discussion about the devaluation of black women in media as performers, directors, editors and professors. Headlined by the legendary Diahann Carroll, the first African-American actress to star in her own television series, Julia, the panel discussed how the treatment of black women in Hollywood reinforces and reflects the tendency to marginalize black women in the general society. A group of women in media spanning four generations from Carroll to Gina Prince-Blythewood, director of Love & Basketball and Beyond the Lights, Gina Prince-Bythewood, to April Reign, the creator of the hashtag #OscarsSoWhite. The narratives from each woman were largely echoed by the next. Carroll shared signing on to a project in the latter part of her career. When she arrived on set, though she had pre-approved her wardrobe, a stereotypical wardrobe had ultimately been chosen for the character she was playing. “One day when I was on set, I had a back and forth with the director in front of the other actors and I decided to just walk away,” Carroll said it was the first time she had ever walked off set. Prince-Bythewood recalled being in a meeting with a studio executive who blatantly told her that black people did not have global appeal and that was why he could not sign on to her project. It is these experiences that are in line with the real life experiences and treatment of black women in workplace and in the general society. The solution as this compilation of women sees it is that change in societal treatment must begin with black women and girls standing up for other black women and girls and not allowing perceived negative views to cloud or distort this segment of humanity. For more on the AAPF, visit http://www.aapf.org/.